Tab from Indeed Podcast to give you a mainly Spoiler-free review of the new movie of TMNT out this weekend. Please note I cry writing this review. Growing up I loved TMNT. It was a great 80’s cartoon, and had some amazing voice actors in it. Cam Clarke, Townsend Colman, Barry Gorden, and Rob Paulsen. Brought these 4 turtle brothers to life and gave us something to remember. Then we remember the 3 Live action films in the early 90’s. /sigh. So here we are back to a new live action film. I will help ease the pain by stating 3 facts. So that aside, we have a good foundation. The movie is slow to start, building mainly around April O’Neil and her pressure to become a major news reporter for Channel 6 news. I was even shocked to see Whoppie Goldberg in this film, She did well in this film. So they build up a pretty big back story to get to the turtles. Once the story with the turtles come into play you find yourself amazed in the creation of each turtle. The voices of the turtles: Alan Ritchson, Noel Fisher, Johnny Knoxville and Jeremy Howard provided a wonderful and unique style to each turtle. The makeup of of the turtles are also crated to be different for each which provided a style that each turtle brings to the film. That is where my enjoyment of the film ends. The human cast, Megan Fox, Will Arnett, Tohoru Masamune, Minae Noji, William Fichtner were a complete and utter disappointment. Poorly timed lines, improper banter and TERRIBLE product placement. (Pizza Hut in New York? WTH) Now to the Foot Clan soldiers who can’t fight or even aim a gun properly. This really pissed me off. They were Terrible. Can I say…Moronic. I did enjoy the slide down a mountain and beat the bad guys while cracking jokes because we are turtles action sequence. Yes, I like it. 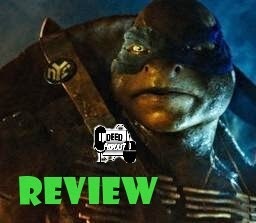 In review, The movie was a 5/10 and not a 2/10 only because of the creativity of the turtles and voice actors. If you can see this movie for under $5, maybe. But wait until Redbox or Netflix on this one. Turtles in a Cracked Shell.